There’s something magical about Hannagan Meadow. Maybe it’s the morning dew and the not-so-distant bugling of elk. Maybe it’s because the cellphone that gets reception here is a rare, special cellphone. 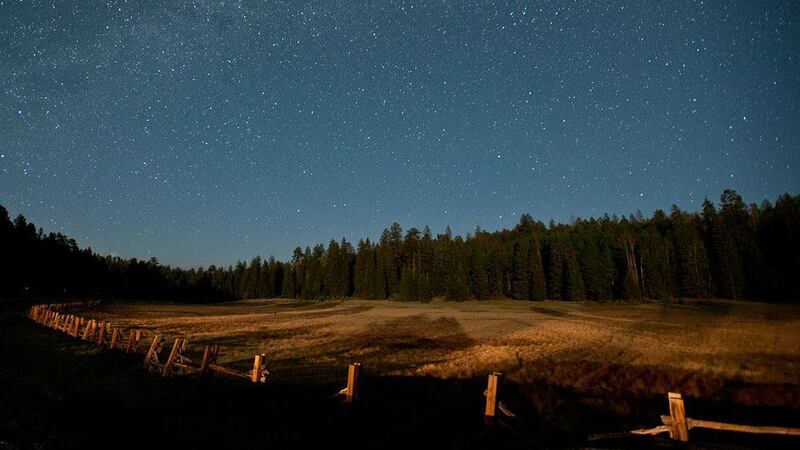 Maybe it’s just because Hannagan Meadow is, hands down, the crown jewel of the Apache-Sitgreaves National Forests. The campground isn’t chock-full of amenities like some of the others in the region, but it is one of the most popular. That’s likely because of its scenery — stately ponderosas, mostly — and wildlife. Birds and squirrels chatter away in the trees, and elk are common. For amenities, you’ll find spacious sites and potable water, and for a song — Hannagan Meadow is a no-fee campground. When you’re not watching for wildlife near your tent, it is possible to venture out on Aker Lake Trail, which originates at the campground between sites 6 and 7. The moderately rated trail is 3.5 miles one way, and leads to its namesake body of water via a mixed forest of aspens and conifers as well as the Butterfly Cienega meadow. Along the way will be even more birds and the occasional mule deer or even a black bear. Have your camera handy and watch from a distance. You might capture a frame-worthy photograph and a magical memory all your own. Although the trail experienced significant damage during the Wallow Fire of 2011, grasses and young trees are emerging from the ash and, at press time, cleanup was under way to restore trail clarity. Campfire Tale: During summer, elk range within a half-mile of water, which means they’re common in higher elevations. There they will stay until snow forces them to lower elevations and easier access to food — weeds, grasses and shrubs.